This figure was obtained by Mr. John L. Cox, at Hampton, Virginia, from Emma Jackson, the Klamath Indian from Oregon. 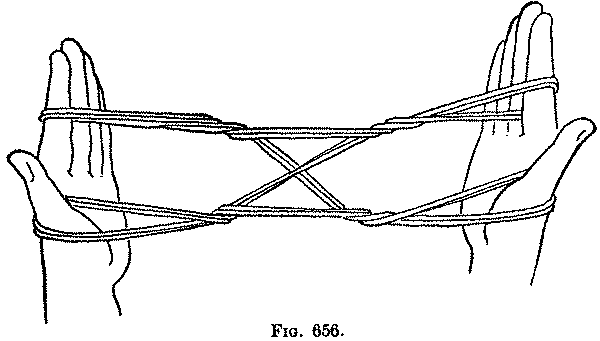 First: The loop of string is doubled and used throughout as a single string. Put the thumbs into the loop, and separate the hands. Insert the left index from below into the loop, and separate widely the left thumb and index (Fig. 653). Put the right index, from above, down behind the strings which pass from the left thumb to the left index (Fig. 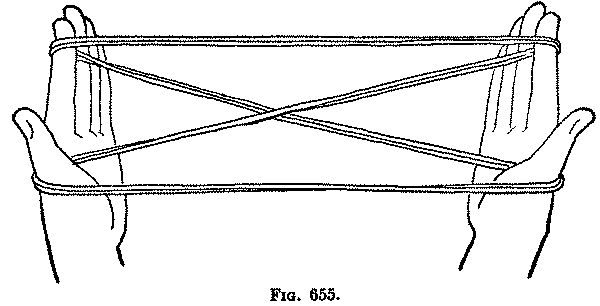 654), and draw the loop out, at the same time turning the right index away from you and up to its usual position (Fig. 655). Second: Give the index loops one twist, by rotating each index toward you, down, away from you, and up again. 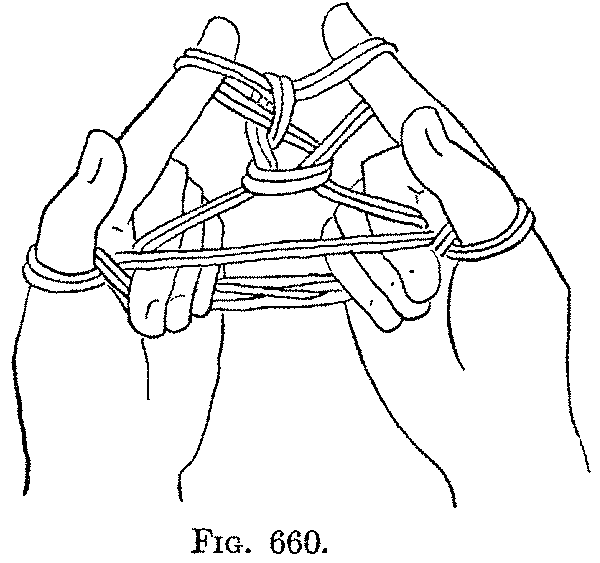 Third: Give the thumb loops one twist, by rotating each thumb away from you, down, toward you, and up again (Fig. 656). 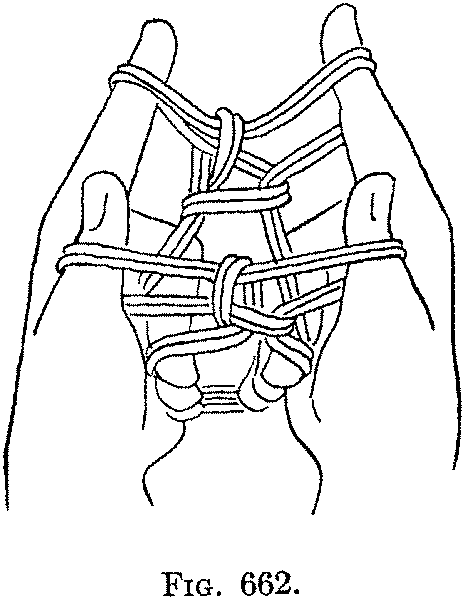 Fourth: Put the middle, ring and little fingers of both hands toward you through the upper triangle at the centre of the figure, then over the cross strings and down into the lower triangle (Fig. 657), and finally close these fingers down on the palms (Fig. 658). Fifth: Put the left thumb from below into the left index loop and enlarge the loop slightly. 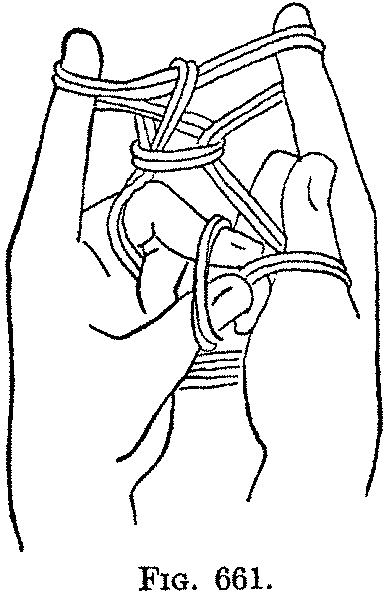 Bring the left thumb and index close to the right index, and pick up the right near index string between the tips of the left thumb and index (Fig. 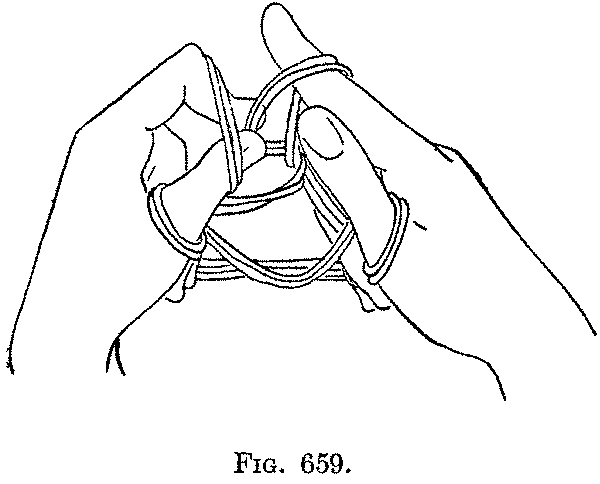 659), and, without removing the right index, draw it through the loop passing around the left thumb and index, which is now allowed to slip off these fingers. 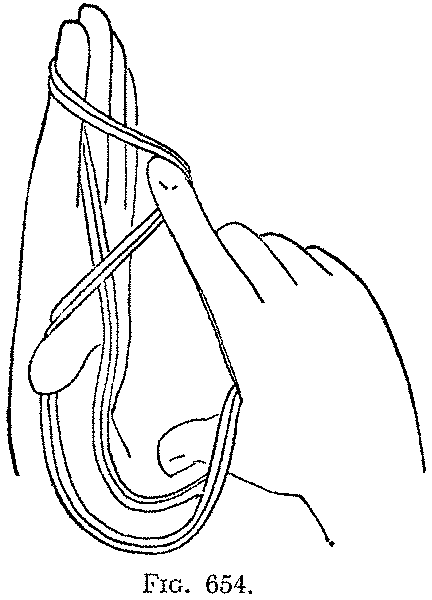 Insert the left index away from you through the loop which you have been holding between the tips of the left thumb and index, remove these fingers and leave the loop on the left index (Fig. 660). Sixth: Repeat the same movement on the thumb loops by putting the left middle finger from below into the left thumb loop, and then, with the tips of the left thumb and middle finger, drawing the right near thumb string (Fig. 661) through the loop which passes around the left thumb and middle finger, allowing this loop to slip off these fingers, but keeping the right thumb in its loop. 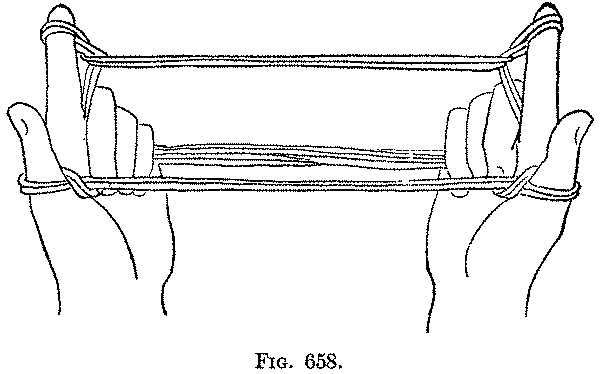 Now insert the left thumb away from you into the loop you have been holding between the tips of the left thumb and middle finger, and draw the hands apart, still keeping the strings held to the palms (Fig. 662). 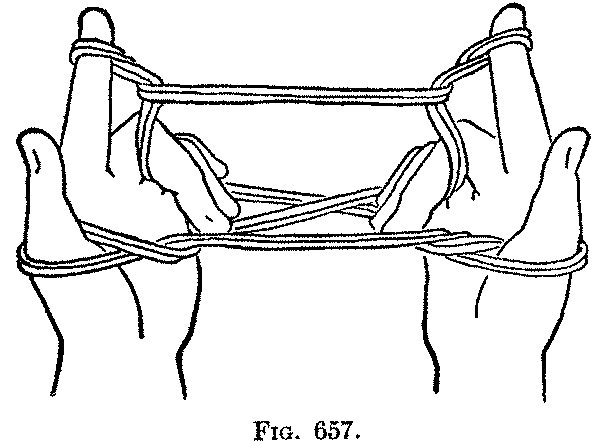 Seventh: Take all three fingers of the right hand out of the loop they are holding to the palm, and put them toward you into both the right index loop and right thumb loop; remove the right thumb and index, and place the thumb on top of the upper strings of the loop (Fig. 663). The "little boys" are made to run by pulling on the upper right hand strings. This is a curious and not very interesting figure although some of the movements are novel. The result produced by the First movement is the same as that produced by the opening movement of the Eskimo "Mouth." If the "boys" appear too near the left hand they must be pushed to the right so that their "flight" to the left may be a little longer.